Anyway, the name "Cheerwine" speaks of a certain je ne sais pas to a 12 year old. Clearly, there's no immediate objections to "cheer," but parents might object to the "wine." Hey, this must be good stuff! And at a church camp! Cheerwine is basically a cherry flavored cola, more to the flavor of a regular Coca-Cola when spiked with grenadine syrup, but it is definitely not a Cherry Coke. Sorry campers, no alcohol. Almost 30 years later, the story repeats. Sorry Mr. Publix check-out guy, no alcohol. He, too, thought it was an adult beverage, and I guess that's a part of what keeps a regional, non-mega corporate soft drink in business. Is it great? No. Is it different? Thankfully, yes. Moving chemically from CO2 to -OH groups, we arrive from a wine of sorts to beer. I don't love beer. But I like "having a brewski" now and then. My wife? Well, she likes beer breath, at least. I'm not going to argue. One thing about beers I've learned is that if I can't see through it, I'm not going to like it. And, while there are a fair number of adequate beers, there are few that I actually enjoy, and those that I do prefer are probably looked down upon by the beer guzzling masses who have more chest hair than I. Such things I keep in perspective. Wine connoisseurs are thumbing their noses at all of us. I'll live. For many years, I never kept beer in the house. This was not due to a moral objection or a fear of my kids accidentally seeing Dad have a sip. I just didn't like it enough to have it around and viewed it more of a social beverage. This was something typically consumed either at dinner (at company expense) or at a sporting event. Go Team. I'm now bringing beer into the house. No, I haven't fallen into a habit of a high blood alcohol content. But I do know where to place the blame, if some exists. HDTV. Yes, you read it right. HDTV. It's like being there. Autumn, college football, and High-def ESPN... How can there not be a beer in the house? Yep, the glorious hyper pixelation of the gridiron must be the cause. But which one to bring home? There are a lot of beers out there to be sampled. I've tried enough that I can recognize a safe choice... Bass, Killian's, Sierra Nevada, Newcastle, IceHouse... But it seems almost an obligation to try something different when the occasion presents itself, whether from a micro-brewery or imported from some far land. 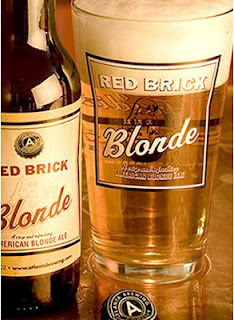 In any case, the topical "Something New" is a beer from Atlanta Brewing Company who offer a series of "Red Brick" branded beers, and particularly the one named "Blonde." I'll add that this preference is completely unrelated to my mom's desire that I seek a wife like the Ms. America who advertised PET Milk on TV many, many years ago. You can guess the hair color. While I admit I lack much technical knowledge of the brewing process, I feel qualified to say that it's flavorful as it goes down, and the memory is pleasantly distinct. Quite the verbose recommendation, I know. But I'll be stocking this in the fridge for those perfect occasions when I have a buddy over, or, heaven forbid, when I drink a beer... alone. I typically go for Icehouse or MGD myself. I can't stand the taste of Budweiser, Coors, Corona or other more "mainstream" beers. And Hienken? Oh gross! But then I grew up in a house where Killian's was what my mom drank on the rare occasion she would have a beer. My birth father drank the more common beers. Isn't it amazing how childhood memories stick with you and shape your tastes into adulthood? I like Amber bock... I also like Pear cider ;) Apple is too sour for me but pear is just right... and not all the brands of pear are ok... ALSO.... Taco mac has a beer on tap call Framboise... raspberry of course... It is rather expensive but if you go there... ask for a sample ;) you may actually be plesantly surprised... though it tastes NOTHING like beer.... CHEERS!